Today’s post is by Christine Berghoef. Growing up in an old farm house with limited kitchen upgrades, I used to question my mom and dad’s sanity in their choice to not install a dishwasher. Between my parents, me, and my three growing brothers who seemed to put down several meals between meals throughout any given day, it seemed an unnecessary extra chore for my mom to have to conquer the messy stacks of dishes scattered haphazardly in piles across the counters, with crusty food stuck on every which way. She rarely asked us kids to do the washing, which I always thought peculiar. Why not assign the culprits of a disheveled kitchen the task of cleaning it up? Our current house does not have a dishwasher. I was anticipating a frustrating bother to have to do the dishes at the end of each exhausting day. But peculiarly, after the noise and energy of my four children subsides each night, after the juggling of the day’s many schedules, after running here and there and to the moon and back, I have come to anticipate my sweet silent serenity at the end of the day in the company of dirty dishes bathing in a sink brimming with hot sudsy water. In the predictable rhythm of liquid warmth swirling through my washcloth as I swab away remnants of the day’s nourishment, the liltingly light splash of the faucet rinsing the suds, and the movement from rinse to dry rack, I am soothed. Unwound. Almost tranquilized. It forces me to pause, to ruminate over the events of the day, to be still. The sequential rhythm invites movement of the day’s gathered prayers from nebulous sentiment to thoughtful, tangible release. “God, forgive me for my impatience today…God, I bless you for providing outdoor space for my children to run unhindered…God, give me courage to live into your way.” On and on the mingled prayers disentangle, line up and parade from my heart through the cleansing of these dishes. There is an additional connectedness that I experience to the women of the generations that came before me. 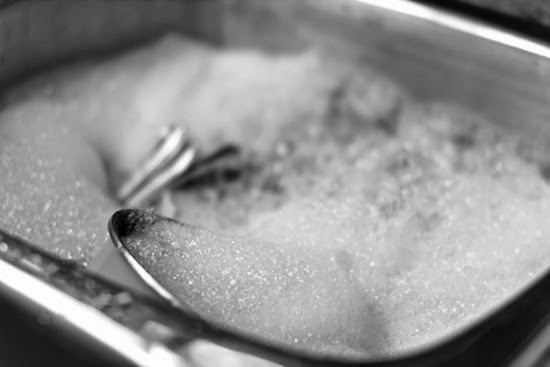 They too faithfully washed, rinsed and laid to dry the dishes at the end of each long day. As I currently live in the house my grandparents formerly lived in, there is a deeper nostalgia that overwhelms me knowing my grandma was bent over with the same daily task in this very sink, looking out this very window, across the stillness of this same field and forest. Yes, with all the changes from one generation to the next, dish washing has been a constant in my family. An unbroken chain of daily routine. A task whose worth I have only recently come to slowly understand and increasingly appreciate in the context of a busy life. But lately as I’ve begun to reflect on my own need of washing the dishes, seemingly antithetical realities have been realized. The busy days… the crazy days… the days when I’m most at my wits end…these are the days I especially need the space to pause, to wash, to rinse, and drain. And with it go my prayers. And with the imparting of my daily prayers, my soul too seems cleansed. The seasons of life when we most lack the time for pause, tend to also be the seasons that we most need to pause. The necessary chore of doing dishes forces me to take that time when I otherwise might not. Someday my life might slow down a bit, and similar to the season my mother is now in, I may be ready for the convenience of a dishwasher. But in this season – a season of juggling the needs of family, and work, and seemingly constant activity, I’ll celebrate the mandatory space carved out just for me at the end of each day to pause, wash, rinse and drain. Christine Berghoef is a published author, (Cracking the Pot: Releasing God from the Theologies That Bind Him, Wipf and Stock Publishers), mother of four, church planter, photographer, and musician. She currently lives in Holland, MI, and works for the Faith & Politics Institute in Washington DC. You can follow Christine’s writing and photography on Facebook. Dishes photo by Hey, Lady Grey.